Originally from London, England, Luke Tiller transplanted to Connecticut in 2003. Newly surrounded by wildlife, he found his love of birds reignited. A professional hawkwatcher for many seasons, his passion and knowledge saw him invited to join the board of the Hawk Migration Association of North America in 2013. He now lives in Los Angeles, California where he is employed as a natural history tour guide and as a member of the Leica Birding Team. His blog is still intermittently updated at www.underclearskies.com. This is Luke’s first contribution to 10,000 Birds. As we roll into the middle of September, so we start to head into peak hawk migration in much of the country as Broad-winged Hawks wing their way south to spend their winter in the Amazon Basin. The migration of hawks can be up there with the most spectacular displays in birding, so If you live close enough to get to a hawkwatch and haven’t been to one yet, then you owe it to yourself plan a trip. 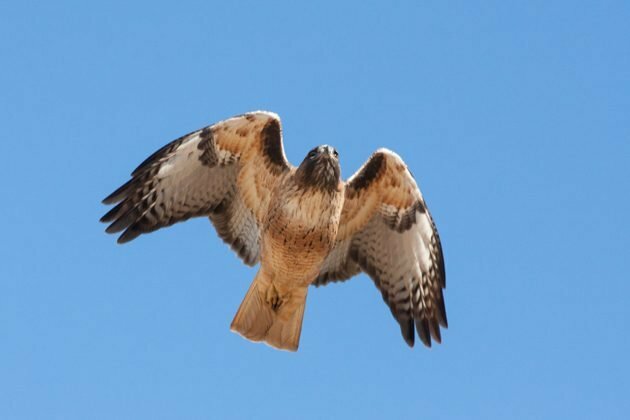 There are whole regions of the country from the Great Lakes west to Nevada where official hawkwatching is essentially non-existent, due to lack of migration density, so If you live in one of the places it is possible to see this magical migration you need to grab that opportunity. When I talk to my non-birding friends about chasing birds, spending hours in a car sweating over whether some half dead vagrant will hang around for another few hours, they invariably think I’m nuts. When I tell them about the day I saw forty thousand plus hawks fly over me they tend to have a slightly different reaction. In my experience non-birders connect with the travel, visiting beautiful places and spectacle of birding and hawkwatching often entails all three. Hawk migration is surely one of the most accessible spectacles of birding for those in your circle not yet convinced by the birding bug. 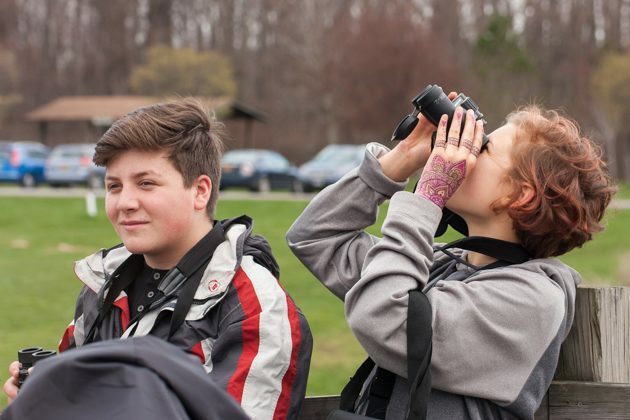 The great thing about hawkwatching is that you can go along and chat at the watch and you aren’t going to ruin the birding, which in turn makes it particularly kid-friendly. As opposed to your average bird walk, talking or even running around making a bunch of noise is fine at a hawkwatch with the one proviso: counting. When a hawkwatcher is trying to remember if the last kettle he saw had 257 or 258 Broad-winged Hawks it the last thing he needs to hear is you counting whatever it is you are looking at. If you want a sure fire way to annoy the your local hawkwatcher just start reeling off a bunch of random numbers while they are having a busy day – that’s pretty much guaranteed to get you kicked off the platform! Closely linked to the spectacle is the ‘quality’ of the birds. People whoever they are (even the most experienced of hawkwatchers) love Bald Eagles – it’s just a given. In my experience if you show a non or novice birder their first Bald Eagle and they will be amazed, show someone their first Thayer’s Gull and they aren’t likely to gasp (sorry, larophiles)! 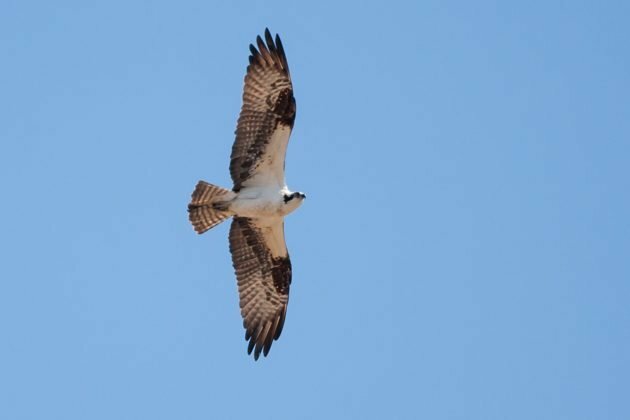 Some birds are essentially just cooler than others and raptors are cool: an Osprey with a fish, a Northern Goshawk, Peregrine Falcons, Golden Eagles, feisty little Merlins, all these impressive birds make hawkwatching fun and exciting. Many of them also allow us to share a positive conservation story too: Bald Eagles, Ospreys and Peregrines all come to mind. Even for your more experienced birder there are some birds you are just more likely to see at a hawkwatch than pretty much anywhere else. In New York and Connecticut spending hours of my time hawkwatching in all kinds of conditions has allowed me to see some amazing species: Golden Eagle, Sandhill Crane, Mississippi Kite, Gyrfalcon, Yellow-headed Blackbird, Bridled Tern, American White Pelican and White-winged Dove. In many states the best chance you have of seeing many of these and other bird species are at a hawkwatch. Identifying hawks in flight isn’t easy, that’s why there are any number of books dedicated solely to it. I always think the best way to learn anything about birds is to go and learn it in the field from someone who knows even just a little more than you do. If you go to any regularly manned hawkwatch on a decent day, there are almost guaranteed to be a bunch of people willing to share all their years of expertise with you. 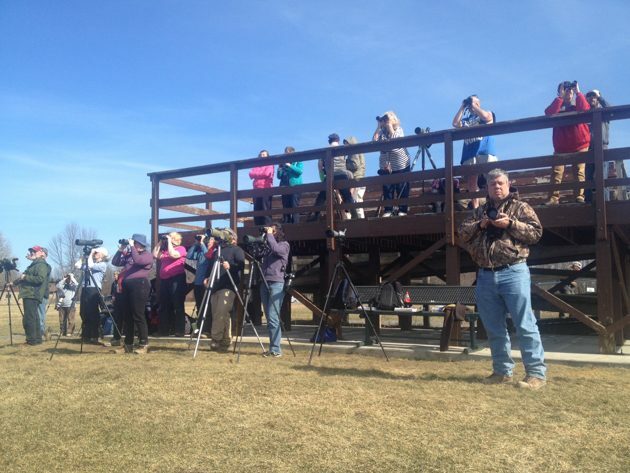 Hawkwatching is a fringe enough element of birding that hawkwatchers are always trying to recruit new converts. If you show up and seem keen to learn, you’ll almost certainly be bombarded with everything you’ve ever wanted to know about how to identify a raptor in flight and more. Not all hawkwatches require a two-mile hike straight up hill just to get to the count site (though some like the Goshutes are well worth the effort), many you can roll out of your car and are right there. Whether you just aren’t a fan of hiking or have some reason for not wanting to take a long hike in the woods, hawkwatches can provide a great place to just sit and wait for the birds to come to you. If hawkwatching sounds like something would interest you, the next month or so sees the peak of fall raptor migration throughout the country. The bulk of many sites flights on the east coast will be made up of Broad-winged Hawks which are essentially on the move now (in the northern US and Canada) through until the end of the month (in the southern US). To find out how to track down a watch site near you, see what birds are moving when and plan your visit to a hawkwatch check out this blog post from the Hawk Migration Association.